Re-recordings are always a double-edged sword. On one hand, they allow fans to hear material as it was initially intended – or at least imagined - with the spot-on production and performances that limited budgets, dodgy equipment and/or nascent musicianship would not allow back in the day. On the other, they simply cannot recapture the raw urgency and genuineness of the warts and all originals, which had a character all their own - even if they sounded like crap – that modern studio sheen is a pale substitute for. And since, in most cases, hardly anyone is left from the lineup that played on the originals in the first place, they are going to have a different personality regardless. This is certainly the case with German veterans GRAVE DIGGER, whose frontman Chris Boltendahl is the sole survivor of the lineups that first recorded the material represented on Exhumation – The Early Years, which are culled from the band’s first three albums – Heavy Metal Breakdown, Witch Hunter and War Games, from 1984-86. Notably, it also features a track from 1987’s infamous Stronger Than Ever album done under the name DIGGER in one of the metal’s more ignominious – and ultimately failed - attempts at selling out. If there was ever a band desperate to find its niche way back when, it was GRAVE DIGGER. The quartet was a decent enough speed/power metal band from a German scene that was really blossoming at the time with the likes of ACCEPT, DESTRUCTION, RAGE, KREATOR, HELLOWEEN, etc. But GRAVE DIGGER had much more commercially minded aspirations – even if it probably never really had a hope in hell of realizing them, given Boltendahl’s phlegmy, Udo Dirkschneider-esque rasp that would have made BON JOVI sound harsh. The DIGGER experiment proved that, and its epic fail prompted a four-year hiatus before Boltendahl and then-guitarist Uwe Lulis reconvened again as GRAVE DIGGER and carried the band forward with the historically minded epic/power metal sound it has today. Prior to the DIGGER disaster, though, the band’s first three albums were rough diamonds of sorts, with some fantastic anthems surrounded by the awkward occasional hard rocker or power ballad, a fair amount of cheese and cliché, and some truly terrible artwork. When GRAVE DIGGER wanted to be, it was a formidably heavy band. Heavy Metal Breakdown was a cavernous album that sounded like it was recorded in an airplane hangar, with songs like “Stormin’ The Brain”, “Legions Of The Lost” and the title track boasting some truly thunderous riffs that caught my ear when I first heard the band on The Metal File program on Montreal's CHOM-FM all those years ago. Good times. Witch Hunter and War Games smoothed out some of the raw edges, but still packed plenty of punch on the raucous “Witch Hunter”, “Fight For Freedom”, “(Enola Gay) Drop The Bomb” and “Keep On Rockin’”. And it's this side of the band that wisely garners the most attention on Exhumation, with the thrashier “Headbanging Man” and “Get Away” mixing with the fist-pumping anthems “Heavy Metal Breakdown” and “Shoot Her Down” and the more ominous crunch of “Tyrant” and “Witch Hunter”. The DIGGER track “Stand Up And Rock” is predictably lame, a dopey pop metal sing-along that is the weakest tune here along with a bland retooling of War Games' “Playing Fools”. Most of Exhumation's 13 tracks, though, stick reasonably close to the original versions, with the most noticeable difference being the lower register of Boltendahl's vocals throughout, which makes them a bit less flinty and easier to digest. But age and 30-some years of howling probably have more to do with that than anything else. Some arrangements, though, have been tidied up or embellished with the addition of more backing vocals, and the production and performances are obviously slicker and fuller. Everything sounds as grand and pristine as you might expect given current technology – and the band's decades of studio and stage experience. Even the cover art/packaging looks more professional - or at least less cheap. But does all this really improve on the originals? Not really. Sure they sound better, and perhaps more complete given the band was able to fully flesh the tunes out – even if the extra backing vocals don't really add much – and fix whatever mistakes were there in the beginning. But they also seem a bit sterile – too perfect. The aggression, exuberance and naiveté that gave the originals their spark and sloppy charm are all tempered here – as you might expect when a bunch of 50-year-olds play songs written when they were 20. 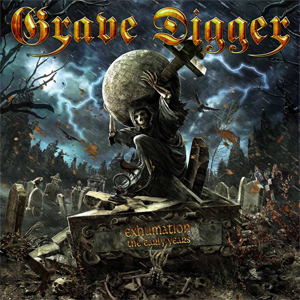 But with GRAVE DIGGER having experienced a resurgence, especially over the past decade, there's probably enough new fans curious enough about “the old stuff” to warrant a treatment like Exhumation. And as such, it's certainly adequate. For purists, or crotchety geezers like, I guess, myself, though there is a The Best of The Eighties compilation from 1993 that features much of the material here in its original, unwashed form – not to mention a few rarities – which might be worth investigating instead. Pre-Order your copy of Exhumation – The Early Years in the KNAC.COM More Store right HERE.